ATLANTA, Sept. 23 /Christian Newswire/ -- Trinity Chapel in Powder Springs, Georgia will be dedicating its new sanctuary, a 4,000 seat auditorium, on Sunday, September 30th, 2007. The auditorium will be the largest of its kind in Cobb County. On September 11th, 1983 Trinity Chapel began in a small storefront building on Austell Road in Austell, Georgia with a message of love, acceptance, and forgiveness. Twenty-four years later, Trinity Chapel has grown into a congregation of over 12,000 members in West Cobb County and has become one of the most culturally diverse churches in Metro Atlanta, crossing all racial and economic boundaries. 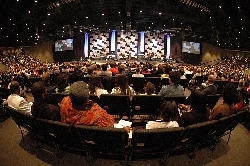 The church had become overcrowded in their previous 2,000 seat sanctuary, even with two services on Sunday. If the church was to continue to grow in attendance, this expansion project, which doubled the sanctuary size, was a necessity. Bishop Bolin says that, although people will be amazed when they see the technology and innovation implemented in the new sanctuary, Trinity Chapel will not forsake her commitment to the message of Jesus Christ and to offering love, acceptance, and forgiveness to this community. Several members of Georgia's state government have planned to attend the dedication services, including Lieutenant Governor Casey Cagle and Representative Earl Ehrhart from Georgia's House District 36. The dedication services will be held September 30th at 9:00 AM and 11:15 AM, hosted by Bishop Bolin. He has been the Senior Pastor of Trinity Chapel for 24 years, and the church is now one of the largest Church of God congregations in the world. Additionally, Bishop Eddie Long will be the main speaker at an evening service at 7:00 PM. Bishop Long is the Senior Pastor at Newbirth in Lithonia, Georgia, a church with over 25,000 members. He is listed in "Church Report" as one of the most influential pastors in the US. For more information about the dedication services or other events at Trinity Chapel, please visit their website at www.trinitychapel.org, or call the church at (770) 222-7023.